Rise in the number of general practitioners, rise in the migration of domestically trained doctors, rise in geriatric population, rise in number of smartphone users and increasing coverage of government or social health expenditure insurance will be the key factors driving revenue growth in Sweden Telemedicine Market. 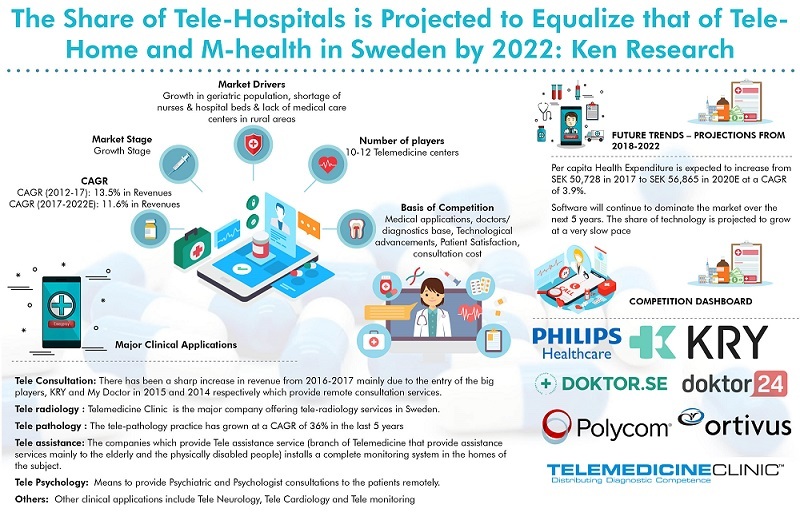 The report titled “Sweden Telemedicine Market Outlook to 2022 – By Technology (Software and Hardware) and By Services (Service Platform-Tele Hospitals & Clinics, Tele Home and M-Health and By Clinical Application -Tele Consultation, Tele Radiology, Tele Assistance, Tele Pathology, Tele Psychology and Others)” by Ken Research suggests a growth at a CAGR of close to 12% in terms of revenue generated through Sweden Telemedicine Market during the forecast period. Telemedicine companies in Sweden are currently offering a limited number of medical applications, with major focus on tele consultation. Some already established companies have started providing Tele Psychology service to cater to needs of mental healthcare of the people. Tele Assistance is another growing medical application. Tele Assistance service was earlier provided by very few companies. As the elderly population of Sweden has grown, the demand for Tele Assistance has also increased which has paved the way for new start-ups to enter in Tele Assistance service practice. Expansive use of Tele pathology to reach expert pathologists remotely has driven the demand for this particular application. The geriatric population of Sweden has increased strongly since 2012. Elderly people require frequent medical care and it is difficult for them to commute to hospitals that often. Thus, the demand for providing the medical care facility at their home has increased. Moreover, the elderly demand Tele Assistance and Tele psychology. Sweden has faced an acute shortage of nurses and with approximately 70% of the nurses reaching their retirement age in the coming decade will further aggravate this shortage. Due to a shortage of nursing staff, hospitals find it difficult to provide medical care to the patients who visit the hospital. Due to shortage of nurses, patients are not able to receive the medical care they need or they have to wait a lot to receive medical treatment. To overcome this problem, hospitals have started to use Telemedicine service. Therefore, hospitals have started referring their patients to the Telemedicine companies like KRY, My Doctor and others for primary care services and as an alternate source of medical care to reduce the burden on emergency rooms and patient’s waiting time in the hospitals.